We are always looking to increase our pool of volunteers, who may be able to help in some way, however small. We need new indoor fosterers with spare room, time and patience to look after cats until they are found loving permanent homes - read more here and call our coordinator on 01223 356999 if you can help. The shop team at 172 Mill Rd, CB1 3LP would appreciate offers of help with a regular shift: Cashiers and back room sorters needed. Our shop is an important fund-raiser for the work of our branch. Do you love sorting things? Or are you a people person who can serve at our till? We’re also keen to hear from those with experience in managing other volunteers. New volunteers will help us expand our opening hours in 2019 to raise more funds!, if you are interested in volunteering, please contact us in the shop, or call our branch coordinator on 01223 356999. Casual event volunteers to help at occasional fundraising or awareness-raising event, even if you can only spare 2 hours at a time, this could really help us man our stalls at events organised by others and our authorised collections outside local supermarkets. If you can help with this, please contact us directly. Would you like to get stuck into a hands-on role helping to manage feral cat colonies in the area? 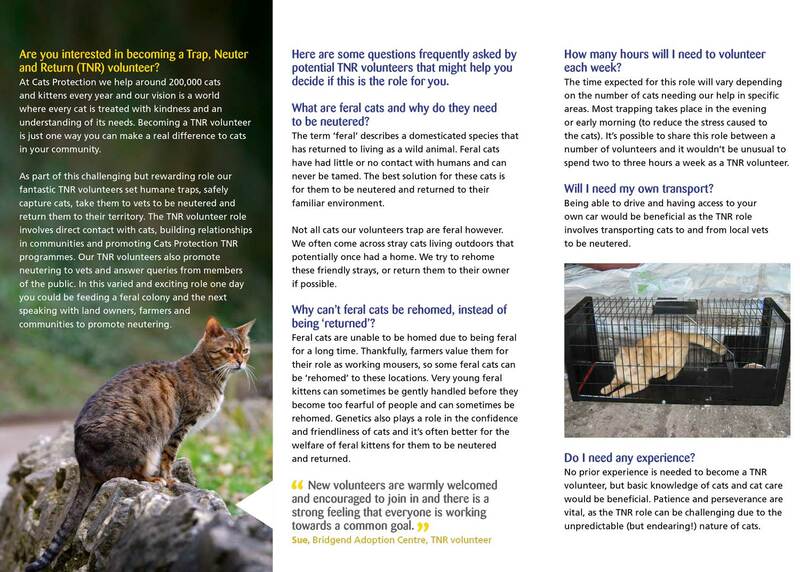 As part of this challenging but rewarding role our "Trap-Neuter-Return" volunteers set humane traps, safely capture cats, take them to vets to be neutered and return them to their territory. Please get in touch if you think you can help. Further details below.